When my children were tiny I discovered the world of picture books. What a glorious world, although sometimes I felt like sobbing when a story had to be read for the two hundred and seventeenth time. However, three classic books that never made me sob are all by Martin Waddell, and they are still in print. Not only did these books not make me sob at the two hundred and seventeenth reading, they were also influential in inspiring me to write my own picture books. Although I adored quirky picture books (and still do), I also hankered for more traditional stories that affirmed my love for our very young children. I wanted to reassure them that the world could be a good place. 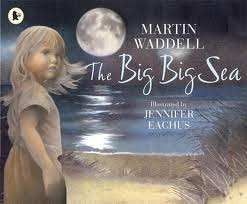 In the nineties, Martin Waddell’s books fulfilled this emotional need and became a potent catalyst for my future writing. I too wanted to write picture books that would speak to others. To celebrate this, here are short reviews of these three wonderful, influential books: Owl Babies, Farmer Duck and The Big Big Sea. Very young children worry when a parent leaves them with somebody else. Will the parent return? Of course! But it’s natural to need reassurance. Owl Babies does this. With simple and spare text, lyrical writing and repetition, the story is a joy to read aloud. The three baby owls are all characters we recognise and they mirror the worries of children without being condescending. 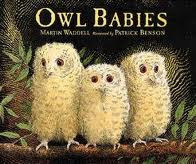 The illustrations in Owl Babies are by Patrick Benson. Unusually for a picture book, there isn’t much variety. However, it’s not necessary. We’re drawn in by the intimate illustrations of the owls with their huge eyes and the way they patiently wait for their mother in the dark, atmospheric forest. Don’t worry, there’s only a tiny hint of the scary night. The use of bark patterns relieves the darkness and the child will only remember the loving warmth of the story. I challenge parents not to get a lump in their throat when they read the last line of Owl Babies (or maybe I’m just soppy!). Helen Oxenbury’s delightful watercolours soften what could be a harsh tale and the different expressions on the faces of the animals and the lazy farmer help tell the story. 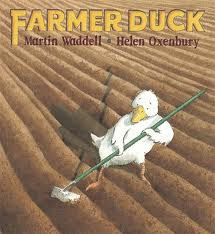 The ending of Farmer Duck is left open and it’s an opportunity for the adult and child to discuss the fairness of the animals taking over the farm and how everybody needs to do their bit. Mind you, I never had one of those discussions with my children and perhaps that’s why they’re so messy? I wonder if this is one of those books that appeals most strongly to the parent? It epitomises the ‘special moments’ we want to share and remember; forever. Quite simply, in very few words, it’s the tale of a mother sharing a night-time walk with her daughter on a moonlit beach. It’s a reminder to parents that quiet, together times can mean so much. The softly-focussed, realistic illustrations by Jennifer Eachus perfectly complement the poetry of the text. So there you go. Three picture books that pack an emotional punch so strong that they inspired me to write. There are other books, but that’s enough of my secrets! Does anyone else want to share their secret influences? Owl Babies, Farmer Duck, and The Big Big Sea are all published by Walker Books and new editions are available from libraries and bookshops. Martin inspired me to write picture books too. Owl Babies is just wonderful, as is Can't You Sleep, Little Bear?, and so many others. Martin's since become a good friend of me and my writing - no bigger thrill than being led up by him into his studio where he wrote, and continues to write, all those wonderful books. Malachy, I'm so glad you told us that and I'm embarrassed to admit I'm very envious. I've often wished he'd visit the UK. 'Let's Go Home, Little Bear' is the only one of his 'Little Bear' books I've read and I should remedy that. I hope the niggles with Blogger/Google Account sort out soon. Seems I'm not the only one who got frustrated today and I also had a lot of trouble posting a comment. In the end I had to give up using Goggle Account and used the name/url option instead. Darn technology! Three books well worth remembering both for themselves, and for their influence on other picture book writers too. These quiet books are loved and needed just as much as the quirky "louder" books. Thanks - and for battling with the bloggin Blogger too! Thanks Penny. I think it's a shame that the quiet, more traditional books are so out of fashion with publishers. All types are needed, just as there are all types of adults and childrn, and all types of situations. Sorry I'm late to comment Paeony. Owl Babies was my granddaughter's first book. I looked after her for 6 months after her mum went back to work and I'm convinced she said 'Whoo' before any other word. She loved that book and so do I... even after the hundredth reading. It contains everything a story should. And apart from Martin Waddell of course, Patrick Benson is superb! Lovely to hear that, Di. I can really imagine your granddaughter 'whooing' :-) It's such a reassuring story to share with a very young child. By the way, long ago, my daughter's favourite book when she was older (5?) was The Whales' Song, but unlike Owl Babies, I didn't buy copies for other children because the printing was so poor compared to my version (I'm astounded at some of the poor quality printing and colour reproduction art that is produced). Yes, it's maddening that publishers only want NOISY books these days. I keep getting told my submissions are too lyrical. My next Walker picture book is called TOO NOISY!, about a small person in a big rumbustious family who craves a little peace and quiet. Here's to more quietness! I'm always being told I need to be noisier too, though that's in connection with older books, not picture books. I know Owl Babies, but hadn't come across the other two - will look them out for forthcoming grandbaby. However, Malachy and Sue, despite my grumbles, I am very interested to hear about this 'noisy' trend.